The inscription on this decorative bowl contains three couplets by famous poets, all expressing good wishes for the owner. It is made of copper covered with a layer of tin. The tinned metal once shone like silver. This bright surface would have contrasted strongly with the recessed background, which was filled with a black composition. Flat dish with a shallow foot-ring and low walls that curve inwards towards the flat rim. The decoration - an unusual three-part composition - has three medallions with cusped outlines filled with a lotus, two split palmettes and other leaves. The interstices are filled withe Chinese-style clouds. At the centre of the design is a small patterned disc. The background is cross-hatched.. The walls show six cartouches with round ends, which contain verses in Persian written in the thulth style, against a cross-hatched ground. Between the cartouches are six roundels containing a Y-pattern. The cartouches and roundels and the band that contains them are all defined by a continuous plain fillet. The spare corners around the roundels are filled with a fragment of arabesque. The rim is decorated with an oblique chain motif similar to that used in the central disc. May the world comply with your wishes and Heaven be your friend! May the Creator of the world be your guardian! May all your affairs accord with your wishes! May the Lord be your guardian! May the high Heavens comply with your wishes! May no harm come to you from evil men's eyes! A conventional combination of three couplets in Persian by three different poets: the first is by Sa'di, from the preface to his Bustan; the second is attributed to Daqiqi; and the third is from the Shahnamah of Firdawsi. The date AH 902 is equivalent to AD 1496-7. Purchased on behalf of the South Kensington Museum (today the V&A) in 1897 from Edgar and Alice Whitaker, executors for the Istanbul estate of William Henry Wrench (1836-96), British Consul to Ottoman Turkey. During his diplomatic career, Wrench had assembled a private art collection of paintings, ceramics, metalwork, arms, textiles, carpets and other furnishings. These were well-known to curators at South Kensington: in 1892, the Museum purchased a set of four photographs, recording how Wrench had displayed the collection in his home in Pera, Istanbul. 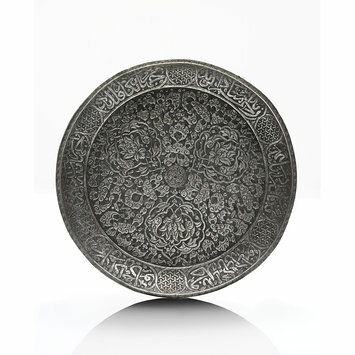 Tinned copper dish with lotuses, cloud bands and blessings in Persian, Iran, 1496-97. A.S. Melikian-Chirvani, Le Bronze iranien, Musée des Arts Décoratifs, Paris, 1973, pp.92-3. A.S. Melikian-Chirvani, Islamic Metalwork from the Iranian World 8-18th centuries, Victoria and Albert Museum, London, 1982, pp.250-52, no. 110. J.M. Rogers, Islamic Art and Design 1500-1700, British Museum, London, 1983, no.191. Linda Komaroff, The Golden Disk of Heaven: Metalwork of Timurid Iran Costa Mesa, California, and New York, 1992, no.18. Rachel Ward, Islamic Metalwork, London, 1993, p.106, fig 83. 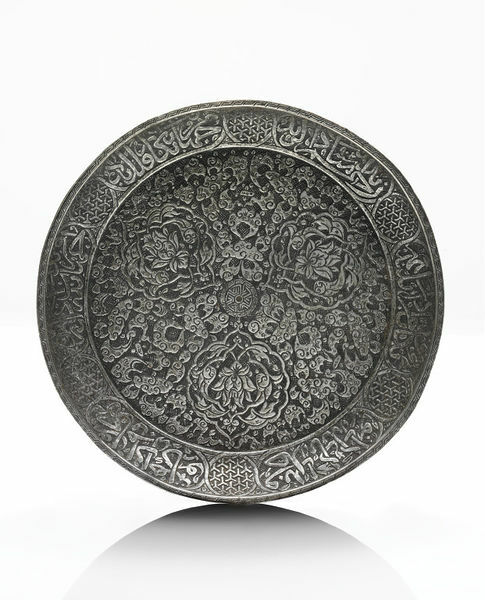 Copper wares such as this dish were being made when the Safavids came to power. The tinned metal once shone like silver. It would have contrasted strongly with the recessed background, which was filled with a black composition. The inscription contains three couplets by famous poets, all expressing good wishes for the owner.